Mars is a planet of geological curiosities that often have no parallels on Earth. Among these include the largest and deepest canyon system — Valles Marineris (over 4000 km long and 12 km deep). Within this canyon system, a suite of light-toned, layered sedimentary rocks occurs that is still elusive to scientists as to their mode of origin and the time when they formed. Various models have been proposed to explain their formation since they were first observed in 1972 via Mariner 9 images. However, a more important question that needs to be addressed first is the time at which the sediments were deposited. Three different opinions exist regarding this matter: a) the light-toned rocks were deposited within the canyons after the canyons formed, b) the light-toned rocks existed in the subsurface even before the host canyons formed, and were exposed after the canyons formed and c) the light-toned rocks consist of both “a” and “b.” Although hypothesis “a” had gained popularity over the decades, and also appears more intuitive, it was not quite tested in the light of newer (2006–2018) high-resolution datasets. A recently published research paper, based on the High-Resolution Imaging Science Experiment (HiRISE), suggests that these light-toned rocks in one of the chasms of Valles Marineris, known as Juventae Chasma, are actually older than the canyon. This paper provides evidence, which shows that the light-toned rocks are emergent from and interstratified with the wall rocks, as also emergent from the current floor of the canyon. This might sound counterintuitive because it opens up a lot of difficult questions — how did these light-toned rocks, which are less resistant to erosion, survive the canyon forming processes, how did these rocks even get into the subsurface, and so on. As it turns out, the upper crust of Mars is a complex amalgamation of layered and interfingered sedimentary and volcanic rocks that were deposited, eroded, and re-deposited in various basins (craters, valleys, depressions) that were formed, filled, and finally buried under newer layers of rocks. 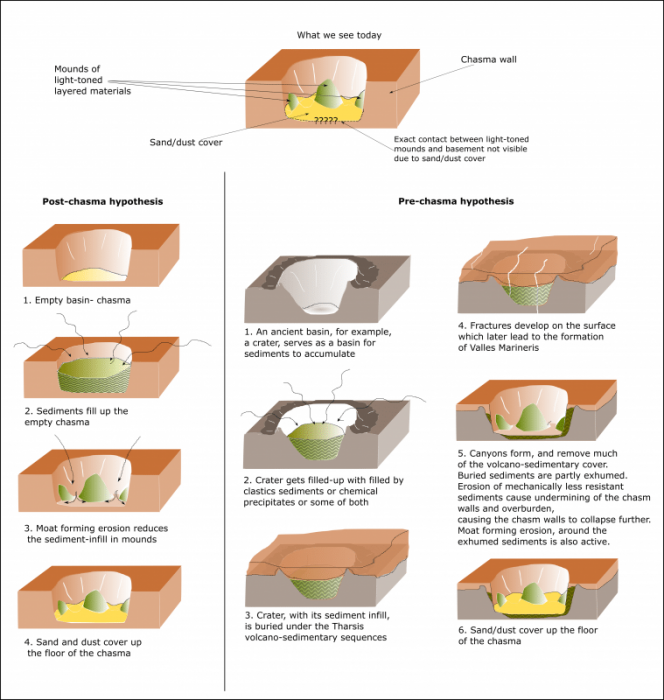 Thus, the upper crust is a ‘cratered-volume’ in which there are numerous such buried impact structures (and other depressions) that were filled with various types of sediments. Over a few hundred million years, these sedimentary materials were lithified and consolidated under the weight of the overlying rocks. At the same time, these rocks were fractured and deformed due to tectonic and structural disturbances that affected the region. As groundwater, charged with ions, flowed through these fractured rocks, it precipitated new minerals along the fractures, which acted as cement and hardened these rocks further. As a result, when the subsequent canyon forming processes affected the upper crust, these rocks were able to withstand the process and stand out as topographic highs, even though the surrounding rocks were faulted, eroded down, destroyed, and removed. 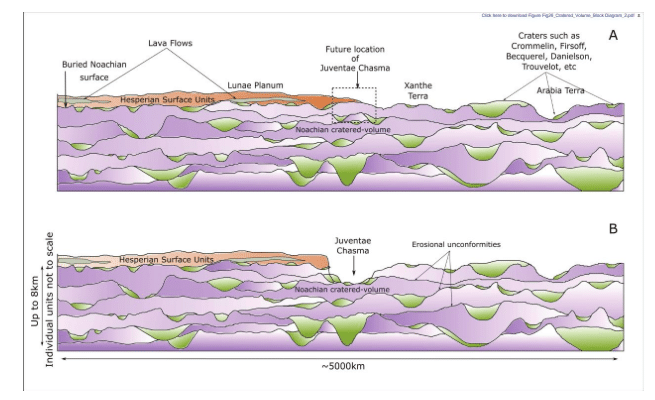 Thus, the present configuration of the exposed light-toned rocks within Juventae Chasma is a case of deposition, followed by burial, followed by erosion and exposure, as opposed to a simple case of deposition. But why is this important at all? Mars, as we know, has many secrets buried away from direct observation, and perhaps some of these include signs of past life and yet-unknown aqueous activities. The light-toned rocks in question are important because they contain certain minerals that are formed in the presence of water. Thus, the correct assessment of the timing of their formation could lead to a revision of our understanding of the environmental condition of an early Mars, when the planet was much similar to Earth. Moreover, such environmental and climatic conditions could have been conducive to the birth of life. Also, most of the oldest rocks of Mars known today are heavily degraded and little information can be extracted from them. In contrast, the light-toned rocks, having spent a significant time in the subsurface under a protective covering, are much less degraded and would preserve the much sought-after pieces of information. An incorrect assessment of the age of the light-toned rocks would devaluate their importance as geological records. In light of the current results, the light-toned rocks would serve as a trove of geological information and could be considered as prime targets for landed missions in the years to come. Such efforts could significantly modify or even alter our current understanding of the geological history of the red planet. 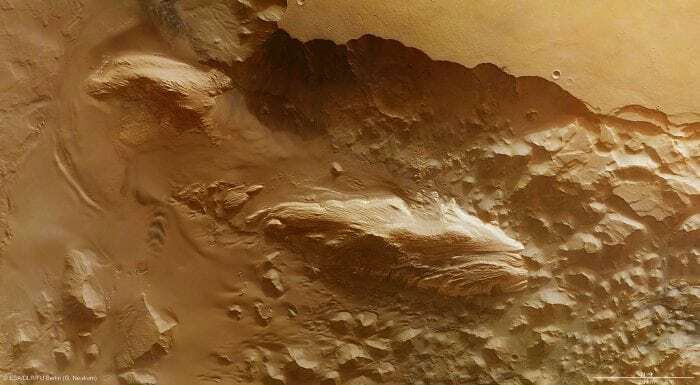 These findings are described in the article entitled The light-toned stratified sedimentary rock exposures in western Juventae Chasma, Mars, in context, recently published in the journal Icarus. This work was conducted by Ranjan Sarkar, Pragya Singh, and Alok Porwal from the Indian Institute of Technology Bombay, and Kenneth S. Edgett from Malin Space Science Systems.